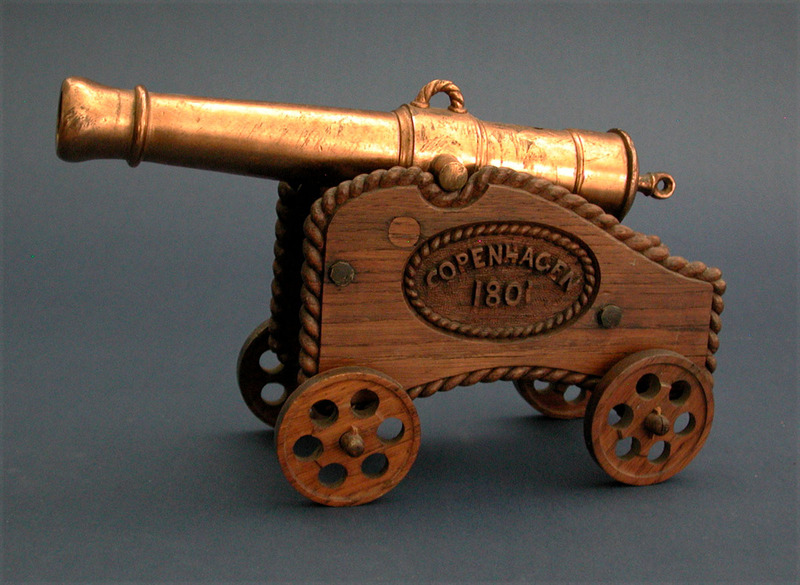 BEAUTIFULLY CRAFTED CANNON MADE FROM THE WOOD AND COPPER OF ADMIRAL NELSON"S SHIP FOUDROYANT. Nicely crafted, 11" long, copper barrel with a decorative rope twist design above the section where the trunnions protrude. The oak carriage with rope twist carving around all the edges as well as around a relief carved oval panel with inscription "COPENHAGEN/1801". The opposite side with a copper plaque with raised lettering "Manufactured From The/Oak and Copper Salved/From Nelson's Foudroyant". Overall length 12". Height 7 1/2". Condition excellent with barrel retaining its original lacquer finish. Wood carriage in original surface and excellent noting that two relief carved letters and one number have chips missing. Overall a very handsome item.